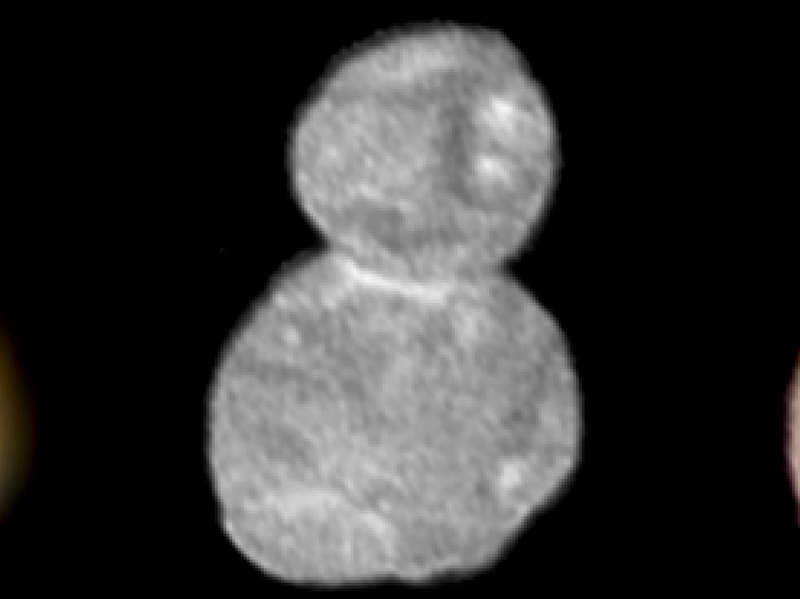 NASA Says Ultima Thule Actually Looks Like A Pancake And A Walnut They had initially thought the object 4 billion miles from Earth looked like a snowman. The New Horizons spacecraft flew by it on New Year's Day, and new images give scientists a clearer picture. Images of the object nicknamed Ultima Thule photographed from the New Horizons spacecraft on Jan. 1. Now, scientists are revising that analogy because of a new image series transmitted to Earth. Rather than the snowmanlike two spheres stuck together, the new images show what looks like a pancake-shaped object (called "Ultima") stuck to a walnut-shaped object (called "Thule"). "We had an impression of Ultima Thule based on the limited number of images returned in the days around the flyby, but seeing more data has significantly changed our view," mission principal investigator Alan Stern of Southwest Research Institute said in a statement. 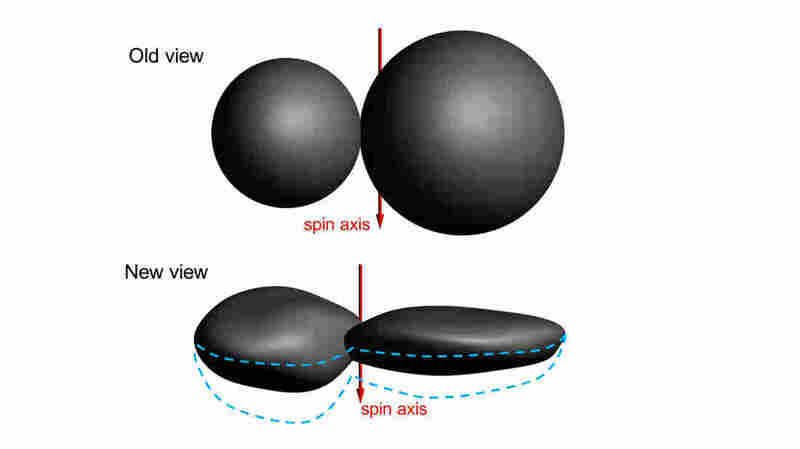 "It would be closer to reality to say Ultima Thule's shape is flatter, like a pancake." He adds: "But more importantly, the new images are creating scientific puzzles about how such an object could even be formed. We've never seen something like this orbiting the Sun." Ultima Thule lies in a distant part of our solar system, more than 4 billion miles from Earth. Its nickname means "beyond the borders of the known world." And the images that changed our view on its shape were the final few that the spacecraft took during its flyby, though NASA says there are many more images that it is still waiting to receive. Ultima Thule is in the Kuiper Belt, which is "filled with thousands of small, icy bodies," NPR's Nell Greenfieldboyce has reported. Scientists picked this one in 2014, she says, knowing that New Horizons could reach it with the fuel it had remaining. The spacecraft launched in 2006 and has previously passed Jupiter and Pluto. "New Horizons is exploring – for the first time – how ice dwarf planets like Pluto and Kuiper Belt bodies have evolved over time," NASA says.